Air Conditioning Repair Seneca PA | Deets Mechanical, Inc.
Are You Looking For a Quality Plumber or HVAC Contractor in Northwestern Pennsylvania? Call us 24 hours a day to speak to a live associate that can help you!!! When it's time for a new water heater, calling Deets Mechanical, Inc. may be the smartest thing you could ever do. Read the reasons why we believe every consumer should hire a professional to install a new water heater. Deets Mechanical can assure your comfort whatever your needs, making your home a warm sanctuary in winter and a cool retreat in summer. Remodel or design new with energy efficient heating and air conditioning systems. Deets Mechanical is a full service electrical contractor providing friendly, competitively priced service to homeowners and small businesses throughout our service areas. Learn more about how you can save money with an annual tune-up through our Deets Mechanical Heating & Air Conditioning Maintenance Plans. See what it includes and how you can protect your investment. Whether you are a long time customer or someone we have not yet had the privilege of serving, we're glad you're here. Please browse our website or give us a call at (814) 676-6665. We're ready and able to support all your home comfort needs. Please look around and let us know how we can help you. 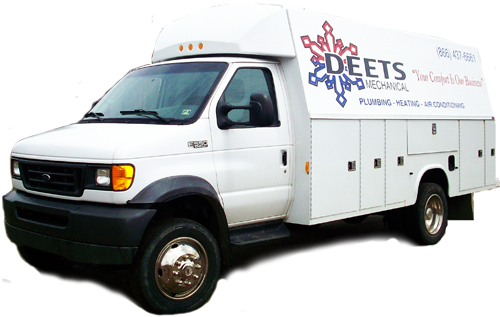 We are a Heating, Air Conditioning, Plumbing and Electrical Contractor, serving Venango, Clarion, Forest, Southern Crawford and Mercer Counties. We promise to work hard for you to be your choice for heating, cooling, plumbing, electric and air quality in Northwestern Pennsylvania. Deets Mechanical, Inc., is a Heating, Air Conditioning, Cooling, Plumbing and Electrical contractor located in Seneca Pennsylvania. Deets will send you only the best technician to fix your air conditioner repair and, gas or propane (LP) furnace and heater repair as well as your air conditioner, furnace, boiler replacement, and tankless hot water heaters installation. We serve the following areas in Seneca PA, Oil City PA, Venango County, Franklin PA, Clarion PA, Clintonville PA, Cochranton PA, Cooperstown PA, Cranberry PA, Crawford County, Emlenton PA, Fryburg PA, Harrisville PA, Kennerdell PA, Knox PA, Parker PA, Pleasantville PA, Polk PA, Reno PA, Rouseville PA, Sandy Lake PA, Shippenville PA, Stoneboro PA, Tionesta PA, Titusville PA, and Venus PA. So when you ask to find "A good heating and air conditioning repair or service company near me," you've come to the right place. Deets Mechanical, Inc. services and repairs all furnace, AC, humidifier, filter, thermostat, air conditioner, heat pump, geothermal, boiler, tankless water heater and water heater brands including Carrier, Bryant, Payne, Lennox, Rheem, Amana, Crown, Frigidaire, Gibson, Goodman, Lochinvar, Maytag, Weil McLain, AO Smith, Kohler, American Standard, General, Aprilaire, Honeywell, White Rodgers, Dynamic, Skuttle, Everrest, Bradford White, Slantfin, Armstrong Air, Airease, Ducane, Luxaire, Duomatic Olsen, DMO, Aireflo, York, Tempstar, Miller, Thermopride, Intertherm, Coleman, Rinnai, Hallowell International, Florida Heat Pump, Hydrotherm, Daikin, Mitsubishi, Fujitsu, Climate Master, Water Furnace.